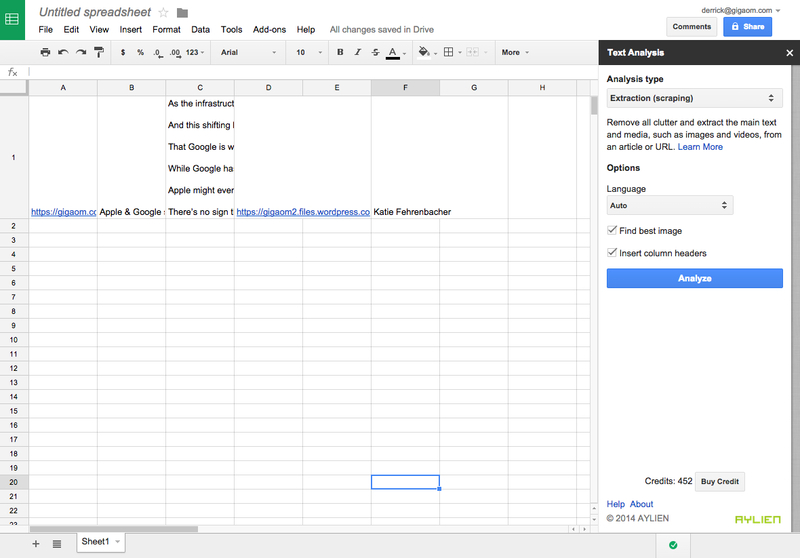 A natural language processing startup called Aylien released a Google Chrome add-on earlier this week that lets users analyze their text right from a spreadsheet in Google Drive. Aylien launched earlier this year, proudly touting its API-based approach to analyzing text and its focus on delivering usable products rather than cutting-edge NLP research. I tested out the add-on, and it’s both easy and useful. It’s capable of standard tasks such as sentiment analysis, entity extraction, content extraction and classification (into preset categories), but also of summarizing long pieces of text and of breaking apart media URLs into separate fields for title, author, text, and images/media. The free trial allows users to process 1,000 rows, which should be plenty to figure out whether it will work. Additional credits start at $10 for 1,000 rows and go up to $200 for 200,000 rows. Extracting the parts of a post from a given URL (in column A). Sentiment analysis is the first thing most people think of when they hear NLP, but it’s usually spotty (Aylien is no exception there), so I think the other capabilities are actually more useful — especially for media companies. I put the Aylien add-on to work first on a 2013 feature I wrote about Hadoop, because it was long and included lots of names and topics. Here’s a word cloud I created from the results, without filtering anything out. Not too shabby considering who I spoke with and what you might expect to find in a story about Hadoop. Next — and this might have been unfair because that Hadoop article is roughly 4,000 words — I tested out the summarization feature. Here’s the 246-word summary it came up with, largely, apparently, by collecting some topic sentences. 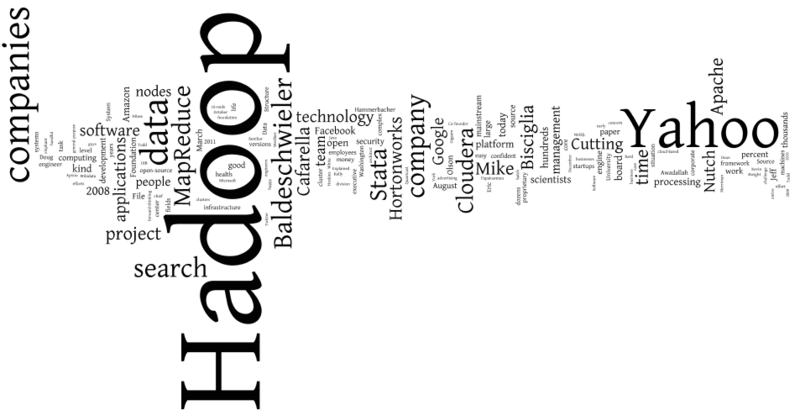 Not perfect, but one could argue that’s a fair version of the Hadoop journey up to a point. Over the course of a few months, Cutting and Cafarella built up the underlying file systems and processing framework that would become Hadoop (in Java, notably, whereas Google’s MapReduce used C++) and ported Nutch on top of it., Anyone vaguely familiar with the history of Hadoop can guess what happens next: In 2006, Cutting went to work with Yahoo, which was equally impressed by the Google File System and MapReduce papers and wanted to build open source technologies based on them., “The thing you gotta remember,” explained Hortonworks Co-founder and CEO Eric Baldeschwieler (who was previously VP of Hadoop software development at Yahoo), “is at the time we started adopting it, the aspiration was definitely to rebuild Yahoo’s web search infrastructure, but Hadoop only really worked on 5 to 20 nodes at that point, and it wasn’t very performant, either.”, It actually took years for Yahoo to moves its web index onto Hadoop, but in the meantime the company made what would be a fortuitous decision to set up what it called a “research grid” for the company’s data scientists, to use today’s parlance., By the time Yahoo spun out Hortonworks into a separate, Hadoop-focused software company in 2011, Yahoo’s Hadoop infrastructure consisted of 42,000 nodes and hundreds of petabytes of storage. As an easier test, I summarized a recent post by Katie Fehrenbacher touting the speakers at Gigaom’s upcoming Roadmap conference. Here, 460 words became 185. Of course Apple has long been a design leader, with the original design-thinker Steve Jobs at the helm for so long, but Google has spent the last several years investing in design and giving Apple a run for its money., That Google is willing to spend heavily on design as a way to get ahead was crystal clear in Fast Company’s recent in-depth profile of Nest founder and CEO Tony Fadell, who sold his company to Google earlier this year for $3.2 billion., While Google has been building its Apple-style design chops, Apple has been flexing its design muscle with the launch of its potentially disruptive Apple Watch, which features entirely new UI innovations., Designer Yves Behar, who will be speaking at Roadmap, commented to Businessweek about the watch: “Everything Apple has done in the last six years has been an evolution of their design language., Google launched its Material Design language earlier this year at Google I/O and will now implement this UI language across its mobile and web products (at Roadmap, you’ll also hear from Google’s VP Design, Android, Matias Duarte). Aylien is competing against a litany of text analysis tools at this point, most notably AlchemyAPI, but also Lexalytics, Attensity and various Twitter-focused sentiment analysis services. I can’t really give a fair comparison of them all, and Aylien’s flagship is still its API, but the Chrome add-on is pretty handy if you’re a Google user, want to get started fast and don’t have a lot of use for API services.